PLEASE NOTE: Used/demo Items will ship within 15 days from date of purchase to ensure adequate preparation time. This is a demo tent from our current Rental Fleet and has been previously removed from the box and setup for display. 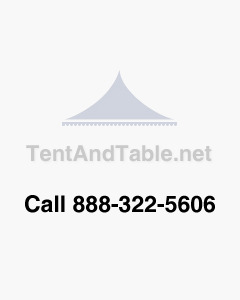 This tent may have some discoloration and stains and may require a light cleaning. Any slight odor can be remedied with a light cleaning and by disinfecting the tent. DEMO PRODUCTS ARE SOLD "AS IS", "WHERE IS" WITH ALL DEFECTS KNOWN OR UNKNOWN. ALL SALES ARE FINAL. NO RETURNS, NO EXCHANGES AND NO WARRANTIES OF ANY KIND EXPRESS OR IMPLIED.